We are privileged to live on the edge of the turquoise sea, with white sand beaches, and see our palm-lined streets. We like to enjoy all that nature has to offer us under water, but we rarely ask what impact do we have on the eco-system in comparision to the benefits it brings us? What would happen if, for example, a hurricane were to hit and our reef wasn’t “healthy”, nor “fit” to protect us? Globally, the coral reef in Mexico is the second biggest after that of Australia. It covers over 1000 km from the coast of Honduras, Belize, Guatemala and, of course, Mexico. The reef is home to over 500 species of fish, 60 coral species, and 350 mollusks. It also has the largest manatee colony in the world with about 1,500 individuals. It is estimated that close to 2 million people are economically dependent on its resources. In addition to being a food source and an attraction for tourism, it is also a natural barrier of defense against erosion and destruction of the coast. The reef is also of fundamental importance during hurricanes. It is also a habitat for important species such as the parrot-fish, which is the largest producer of white sand: it literally eats coral and expels the remains which transforms into white sand. It is capable of producing one ton per year. It is important to protect the barrier, both for the preservation of species, but also for maintaining the economic resources of the population. To give a concrete example, when Hurricane Wilma passed our shores in 2005, the coral reef barrier reduced the strength of the cyclone that was about the strength of 7 atomic bombs to only about 0.02 bombs!! -Some types of coral only grow’ 1 cm per a year. -25% of marine life depends directly on the coral reef. -3/4 of the reefs in the world are now threatened. -80% of the coral supply depends on the algae Zooxanthellae which generates oxygen with photosynthesis. - Jusqu’à 6000 tonnes de protection solaire sont libérées dans la mer tous les ans, certains ingrédients sont extrêmement nocifs et peuvent amener à tuer l’algue que consomme le corail. 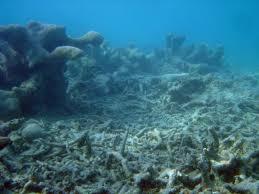 -An increase of just 1.5 to 2 degrees is enough for the same algae to leave the coral, causing bleaching and death. -The island of Cozumel gets between 3 to 5 million visitors a year with 30% practicing water activities. 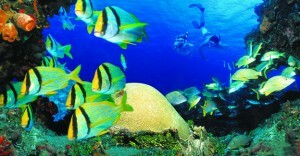 -The best known reef divers on the island of Cozumel “Paradise” attend up to 700 to 1000 per a day in high season. What are the threats to the coral reef? -Tourism-the Riviera Maya is the top tourist destination in the country with numbers of visitors increasing every year. Up until now there seems to be no big impact on the coral, but if thousands of people were to touch or reach the coral it could have a dramatic effect. -Agriculture-the releasing of fertilizers and pesticides into underground rivers that reach the sea. -Les changements climatiques, provoquant des différences de températures, ou encore les ouragans qui peuvent endommager fortement le récif, comme à Tulum par exemple ou le corail est pratiquement mort. - The sunscreens that contain filtered chemicals. This is one of the most threatened eco-systems. To see the impact that we can have on the reef, we must understand that everything is connected: the reef, the mangroves, and sandy areas. … The coastal sand beach just above the beach seems very fertile and it usually isn’t so common to generally see animals in the vegetation. However it is very important to protect the ecosystem inside the sea. The sea, the beach, and the dune form a single system, then there is the mangrove, the palm trees, and forest. Everything that happens on land will help reduce the physical and chemical impact of the ecosystem right inside the reef. Human activity-such as there have been in the last two three years in Cancun and Playa del Carmen or where the government decided to put sand on the beaches that were disappearing-can gradually damage the reef; this is the quickest solution that the state provided “to save” the famous beaches of the Riviera Maya, but the quickest solution isn’t always the best. In Cancun, the beaches where we try to maintain large areas of sand, the system continues to erode as it is a natural process. There are areas (such as some like the hotel Bahia Principe…which have implanted breakwaters that have caused an accumulation of sand on the side of the break wall and erosion the beach. So there is a benefit on the one hand, but also a loss on the other. Making quick decisions can be detrimental to nature as we know it, but also to humans. For example in Cancun, when hotels removed sand dunes during the passing of Hurricane Wilma, a loss of several million pesos in infrastructure was recorded. It has been pointed out that what has been invested to recover the beach was three times what was invested in infrastructure. This expense certainly could have been avoided if the buildings were not so close to the sea. The federal agency that manages the Litoral Zofemat informs us that it is normally impossible to build less than 20m from the sea, which corresponds with the laws of the Federal District. Unfortunately this is hardly-or even never-ever met. - The best thing to do is to protect and conserve the natural sand dune with plants that the hotels remove in order to have only white sand beaches. -Do beach clean-up projects and don’t leave trash, nor even cigarette butts. -Do not use sunscreen in the water, but do wear protective clothing. -And finally, educate and inform young people so that the information passes to future generations. - Never feed the fish and don’t touch the coral.